how do you grab attention in a competitive job market? if you’re in one of the performing arts, compiling your best clips into a promotional reel as part of a mailing makes it easy for any prospects to see exactly what you do as soon as they receive it. 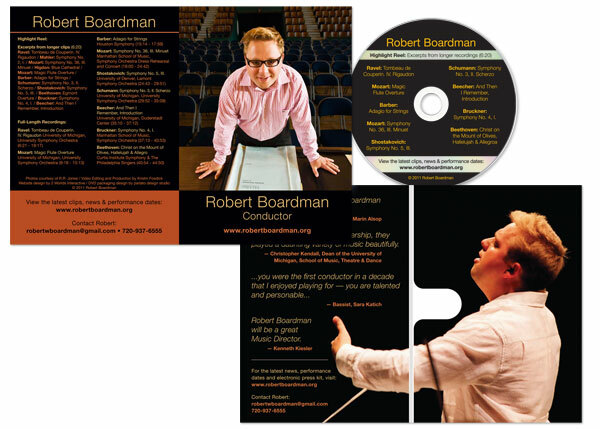 as an addendum to his web site and youtube channel, conductor robert boardman contacted me to create a dvd in the same style as part of his intro kit mailing, for maximum exposure to music department decision makers. i was happy to help showcase his energy and personality to get him one step closer to connecting with his dream jobs.